I can’t believe it’s already August! Summer is flying! Also, I’m not reviewing something that came out this year, in fact, this book was published in 2012 with glowing reviews, which I don’t really understand, but let’s jump into it. 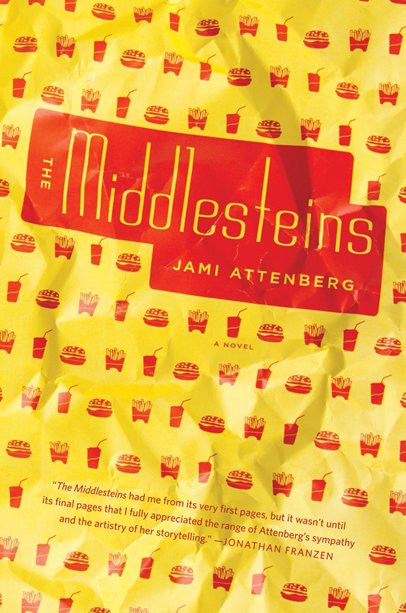 Jami Attenberg’s third novel is called The Middlesteins and you guessed it, is a book about a family called The Middlesteins that live outside of Chicago. The main character is the obese, diabetic, and dying Edie Middlestein. A child of a Russian Jewish immigrant who could never get full, yet never gained any weight and a loving Jewish mother in Chicago, Edie is slowly killing herself and tearing her family apart with her unhealthy and disgusting eating habits. A family not known for change is suddenly thrown for a loop when Edie’s husband of 30 years, Richard, decides to leave his wife and be a bachelor. Now Edie’s two children, Robin and Benny, along with his perfect Jewish wife, Rachelle, are determined to save Edie’s life, while also stressing themselves out in the process. Critics praised the novel as a modern take on the American Jewish family with a topic that is plaguing the nation – obesity. They said how they loved the writer’s ability to jump from one narrative to another (which, it does), the sudden change from present to future while describing a character (the writer will be talking about one character and then suddenly jump several years into the future and reveal something about said character) and the wit that goes behind each character’s perspective. I honestly did not think this novel was funny at all…I have a hard time thinking that a first world problem, like obesity, is funny. Also, I take issue with certain first world problems like obesity, hoarding, and shopping…just because it is a result of over abundance, which means that every single other basic need is met, so you’re destroying your life with something that’s a product of capitalism and boredom. I will say that despite my dislike of this novel, I did find it captivating enough that I finished it. My main problem with this novel is that I really didn’t connect to any of the characters or the story. I understand that everyone is a complex and difficult creature and everyone turns out the way they turn out, but I really could feel no sympathy for any of the characters. I also found it frustrating that certain characters, like Robin, the gloomy daughter of Edie and Richard Middlestein, never evolve. She becomes more of a bitter, stubborn alcoholic who never develops, and never really has any struggles to be upset about…much like everyone else in this novel. For example, Edie never stops eating. In fact, I’m not ruining anything, but she dies standing next to the freezer waiting for her lover to come with…more food. Another thing I found frustrating is that a lot of young American writers use a sort of magical realism in their work that doesn’t really work and kind of defeats the purpose of using that type of literary device. It makes me think that a lot of young writers read one Gabriel Garcia Marquez book in high school and decided to take of him mysticism and throw it into their book, but it falls flat and reads as a young person trying to be deep. The whole part in the beginning about how Edie’s father starved on his way from Russia to the USA and could never get full again, but he constantly ate, yet never gained any weight, reminds me of this common problem with young writers. The same goes with the sudden jump randomly from present to future to reveal something deeper about each character. It felt flat. This quote is literally how I felt at the end of the book, I didn’t care if anyone lived or died. I just wasn’t invested and how could I be when the main character is not even remotely invested in her own life? I did find one thing amusing in the novel – the juxtaposition of Edie Middlestein and her perfect and trim daughter-in-law, Rachelle Middlestein. Consumed with repulsion at her mother-in-law’s unhealthy eating habits and calling it upon herself to save her life, Rachelle becomes like Edie but the opposite. Instead of smothering herself and those around her with food, she becomes repelled by food and frightened by the prospect of anyone in her family becoming fat. Dinner becomes a place that her family dreads, because there is barely anything to eat. There are vegetables made without love or salt. Flavorless boiled fish. Everyone is left starving. The result of which is Rachelle’s rebellious daughter falling out of her window in attempt to leave the starving household and her husband, Benny, going bald from stress and poor food. So, would I recommend this book? I think I gave a lot of contrasting opinions about this book, both that I didn’t really like it but I also kept reading it. I think if you’re looking for a simple book that’s easy to read with a fairly modern, yet stilted story, this might be for you. If you’re looking for something richer, then I think The Portable Veblen might be more up your alley. It’s a lot funnier, more modern, and there is also another annoying mother who’s basically killing herself slowly. Either way, you won’t miss out if you skip this book, but it also doesn’t hurt to check it out. Now, let’s go eat some vegetables with salt!